HomeMeghan MarkleMEGHAN MARKLE’S RUFFLED JASON WU DRESS IS FINALLY AVAILABLE! MEGHAN MARKLE’S RUFFLED JASON WU DRESS IS FINALLY AVAILABLE! Happy Monday! Hope you all had a great weekend. 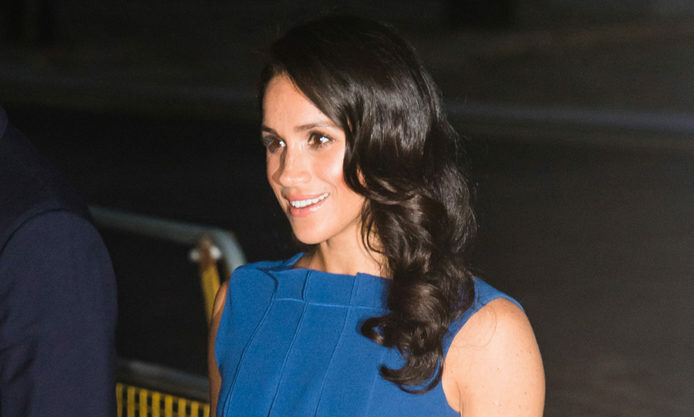 To start the week off, I thought I’d share this royal blue look Meghan Markle wore to the 100 Days of Peace Concert, a charitable event she attended with Prince Harry. She wore this ruffled, cobalt blue Jason Wu cocktail dress back in September, but at the time the dress was not yet available to shop… now it is! It is available in sizes 0-8 and is a gorgeous piece that is suitable for anything from work events to weddings. A week earlier at the WellChild Awards was when I first suspected the Duchess of Sussex might be with child, as that is when she began carrying her bag in front of her stomach. Then when she stepped out in this ruffle-front number, I was even more convinced she had conceived! The ruffles on this dress are stunning, but also clearly a great way to conceal a growing baby bump. This color looks magnificent on her, don’t you think? I love how she doubled down on blue with Aquazzura’s Portrait of a Lady pumps. They’re still available here, but are quite pricey (as is her dress). Shop her exact dress here and some lookalikes for less below! Leave a comment on MEGHAN MARKLE’S RUFFLED JASON WU DRESS IS FINALLY AVAILABLE!